Isatu is sevem as she would say. She won't smile all the way in these photo's because she is missing her two front teeth. 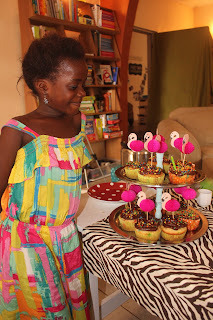 For her party she, Ivey and I painted fingernails, put on makeup, and made party hats. Obviously, we did not do hair. I am the worst at hair, especially in this humidity. 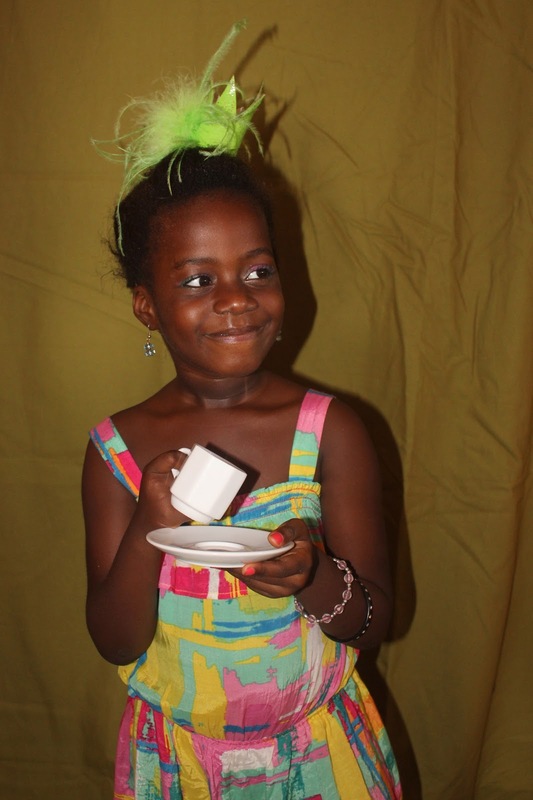 We then had the boys join us for a tea party with crowns and all. As you can see from this photo Albert wasn't amused. Cold tea in tiny cups wasn't his thing I guess. Isatu has asked me for an apron countless times. She loves to be in the kitchen, serve bowls and taste everything. 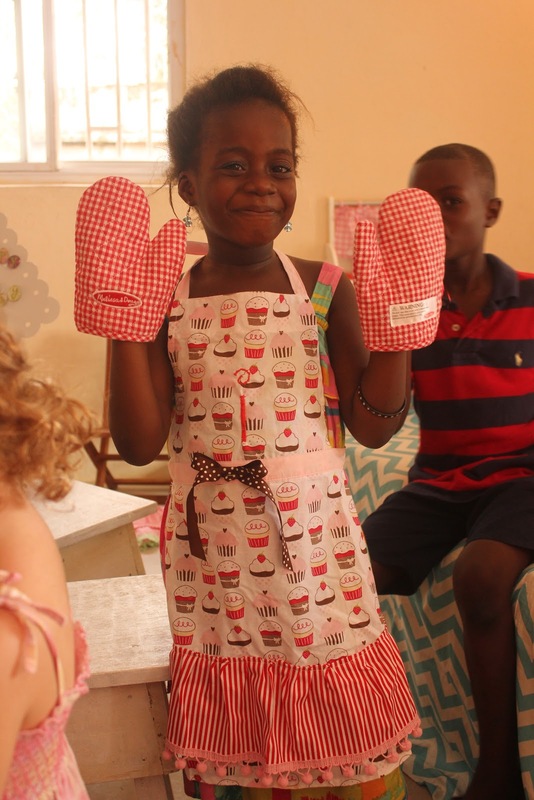 I am sure that she will be some kind of chef or taste tester. So for her gift we gave her an apron and several food items for the kitchen. She and Ivey promptly began the preparations for 'dinner' while the boys did what boys will do and made the party blowers into weapons of mass destruction- all the while laughing contagiously. Also, Albert turned 15, or so we thought. For him we had a different kind of party. We let him play any music he wanted as loud as he wanted. That meant the music they play in Krio on the radio here with the dubbed-in atari sounds that drive Andrew crazy. Once DJ Alberto was ready we had a dance party with glow in the dark balloons(thanks to pinterest). 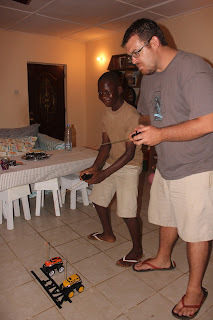 Then we had a race with remote control cars, ate cake and played some more. As for Alberts gifts, that was a long time coming. About two years ago I went with one of the TRS teams to Kroo Bay where we served food and had a short prayer and song time for the kids we were serving. There were hundreds of kids in the room including about 15 of the older kids from TRS that were allowed to come with us on this service project. Albert was there. I watched him lead these hundreds of kids in a prayer and sing songs with the other leaders in the making. And I felt so privileged that God had allowed me to be a part of his life. After the food was served I saw him at the window staring out into the distance and I wondered what he was looking at. As I approached he was so lost in this vision that I startled him. He was watching a boy ride a bike. I asked him if he had ever ridden one. No he had not. I made the decision right then and there that if ever given the chance I would buy that boy a bicycle. October the 13th 2012 was the day. Here in Sierra Leone they don't do the same paperwork in the same time frames as you do in the US. So apparently some people never get a birth certificate and some people may get theirs months or years after they were born. Therefore, the certificate may just be a close estimate of the birthday. In a turn of events Albert's family came to town this last week and brought his birth certificate. It showed that he is younger than we thought. And that he wasn't born in October. So, we didn't actually celebrate his birthday on his birthday and for now he is 14. The first time I heard Albert's story I remember feeling so bad for his parents. I can't imagine how terrible it would be to have to watch your child be hungry or to have to trust someone else with them in hopes for something better. Albert expressed the desire to see his mother again and I hoped that I too would be able to meet her. I met his father before. That proved to be a difficult task though because they live in a village that is many hours into the bush and there would be no place for us to stay. So, Albert and I would have to wait. Last week we got our chance. The parents came to do business in town and let us know that they were here and they would like to greet us. How exciting. We found out that Albert's mother has just had another baby. Apparently, her birthday isn't what we thought either because I was under the impression that she was too old to have any more children. So we met them at the center and Albert was beside himself. His usually patient and quiet way was sidetracked by his excitement. I let him sit in the front seat and he kept talking to stalled cars to hurry up and get out of the way. As we approached the gate he gripped the passenger handle of the car. Once there, there was no stopping the jump from the car. I almost didn't get a photo of it. I should note that the fact that they do not stand to greet him is cultural and not an indication of their excitement. Albert likes babies and holding babies. He loved holding his own super cute baby brother, Bundu. Years ago when we were in the U.S. Erica gave me a necklace that had our three kids photo epoxied on. When I would wear it I would be reminded of them and pray. On this day I have quite different reminders when those three kids yell through the house and come up to me 20 times a day telling me they are hungry or the three extra times a year when my calendar tells me it is time to plan another birthday party. So since I have no need for it now, I gave that necklace to Alberts mom so that she now can be reminded of a child she loves and remember that I promised to take the best care of him that I know how. Including some very merry un-birthdays. wow, great blog! I love your blogs! Wish I could have been there to celebrate with you!!!! Hope they have a great time with all their new gifts. Thanks for sharing all the pics. Love you all!! !